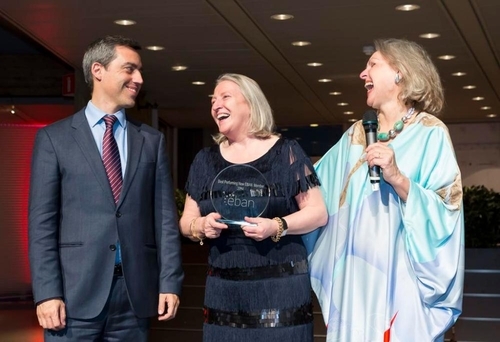 As part of the recent EBAN 2015 Angel Summit, the EBAN Awards Ceremony took place in the Evoloun, on the evening of 7th May 2015. This special event celebrates individuals and organisations that have made a successful and significant contribution to the early stage investment market. The best in Europe were honoured at this exciting event! The EBAN 2015 Angel Summit was a three day event attended by more than 300 representatives of the early stage financing industry and entrepreneurs from all over the world. The event took place at the High Tech Campus in Eindhoven, the Netherlands, Europe’s leading innovation hub and R&D center, from the 6-8th of May. EBAN 2015 Angel Summit, centred on the theme of creating, financing and building global success stories made in the EMEA region, welcoming business angels, family investors, VC funds, business accelerators, seed funds and venture philanthropists to interact with entrepreneurs from all over Europe and the World. Michael O’Connor, CorkBIC drove the EBAN e-Xcelerator Venture Academy with investors and 25 growth companies while Eileen Moloney, chaired a session during the conference on Expanding the Venture Finance Eco-System with Corporate Venturing and Business Accelerators. Michael is co-chair of the EBAN Accelerator Committee or e-Xcelerator, working to develop a working alliance between Accelerators that invest in companies and Business Angel Networks across Europe. Accelerator founders seek the finest well connected Business Angels to mentor and invest and those running Business Angel Networks seek the finest well prepared growth companies.